Melina Aslanidou was born in Stuttgart and grew up in Greece. The young Greek began to be interested in music very early on; Already at the elementary school, she joined the Choir of Paralimni (Greece) and became acquainted with the music of Pontus and Byzantium as well as the traditional music of Thrace. Meanwhile, Melina Aslanidou is one of the most famous singers in Greece. “Greek Spirit 2018” is a passionate show with Melina’s greatest hits and a selection of songs from her home country and the Mediterranean – a synthesis of Greek culture – with her brilliant musicians and the Bouzouki virtuoso Andreas Karantinis. Enjoy the “Greek Spirit” with Melina Aslanidou! 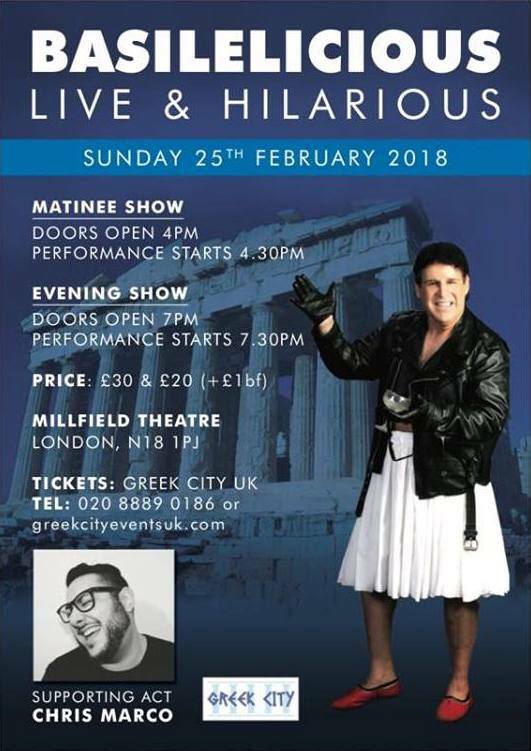 SEE the Greek singer at the Union Chapel Islington, Compton Terrace, London N1 2UN, on Friday 2nd March 2018, 7 pm-10:30 pm. Two years ago, the ”Yannis Kotsiras European Tour”, left us with the best impressions and a rare sense of fulfilment. So, once again this special Greek Artist is coming back to sing for us all those songs that we have loved throughout the years, since his very first album. This time, he will present even more new songs to love from his latest record Ψεύτης Καιρός/ Pseftis Kairos (Lying Times) that was released in 2016. And of course, a selection of all time favourite songs by the greatest Greek composers and songwriters. BASILELICIOUS LIVE & HILARIOUS TOUR Basile The Comedian is heading for London this month. He is supported by Chris Marco K.
Tickets for the matinee at 4 pm and evening at 7 pm. One of the most popular Greek singers of the last 50 years has refused to represent Cyprus at this year’s Eurovision Song Contest. Claims that Helena Paparizou turned down the offer were made on Cypriot showbiz portal ‘ShowTime’, which soon spread on Eurovision fan websites. The Cypriot broadcaster has not yet confirmed or denied the rumour, however, ”Cypriot sources” have suggested that long-term negotiations between them and Helena Paparizou’s team have ended, with the star reportedly to have said ‘no’ to the offer. The Eurovision champion of 2005 was said to have loved the ”up-tempo ethnic-fused track” that was being prepared for the 2018 contest, but decided that she wasn’t ready to make a third appearance at Eurovision. London Greek Radio has been following the Cypriot selection this year. It was last heard that a Cypriot sing-off final was to air this month. The television final was to have finalist candidates from the Cypriot auditions, held in November. A three member’s judge’s panel short-listed 24 hopefuls from 64 applicants. In order to impress the Cyprus entry author Alex Papaconstantinou, choreographer Charis Savva and Christer Björkman, producer of Swedish Eurovision selection Melodifestivalen. The composer Alex Papaconstantinou or Alex-P will write our Cypriot song. As previously mentioned on LGR, Alex P is a well-known producer of Greek-Swedish origin and has co-written hits for Marc Anthony, Jennifer Lopez, Enrique Iglesias and many more. He is known in Eurovision circles with a few Euro-stompers under his belt, including Ivi Adamou’s ‘La La Love’ in 2012 and Sarbel’s ‘Yasou Maria’ in 2007. His most successful entry to date was for the Azerbaijan duo Aysel and Arash, which came third in 2009. The Cypriot rules have referred to ditching the Cypriot sing-off – as an option. The other solution is both a singer and song is internally selected without a Cypriot contest after all. Sources claim an official statement is expected to be released shortly confirming the Cypriot entry’s singer/performance artist, who will be singing the Alex P tune. Check back for all of the latest developments to find out whose singer name is flying the Cypriot flag for the Eurovision Semi-Final in Lisbon. Detectives investigating the murder of Iuliana Tudos in Finsbury Park have made an arrest. The 31-year-old man was arrested at around 13:30hrs on Monday, 1 January, at an address in Dalston. He was arrested on suspicion of the murder of Iuliana Tudos. The man has been taken to a south-west London police station where he remains in custody. A murder investigation, led by DCI Nicola Wall, was launched after Iuliana’s body was found by a member of the public at 16:25hrs on Wednesday, 27 December. The body of the 22-year-old, who was also known as Julia and Lili (short for Lilith), was found in a disused building located in the north eastern area of the park. Iuliana lived in Upper Tollington Park, Haringey. Officers and London Ambulance Service attended and Iuliana was pronounced dead at the scene. Her next of kin, who are currently living abroad, have been informed. A post-mortem examination took place at Haringey Mortuary on Thursday, 28 December, and gave the cause of death as a stab wound to the abdomen and a head injury. Further tests are ongoing. Haringey Borough Commander Detective Chief Superintendent Des Fahy said that extra officers had been deployed for reassurance and that his officers had been engaging with local residents, community groups and traders. He said: ”We understand that the local community might have concerns, but I want to reassure people that incidents of this nature are incredibly rare. ”We have police out and about on patrol and local Neighbourhood Policing Teams have been out speaking to members of the community.